Embracing effortless sparkle and contemporary shine, these sterling silver cubic zirconia double heart drop earrings will add the perfect touch of glitz and glamour to your look. 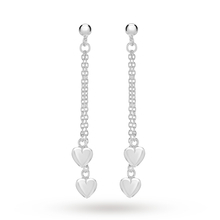 With their feminine charm, and inescapably romantic vibes, these earrings feature classic Sterling silver heart-shaped silhouette. Perfect for enhancing your everyday look, or as a memorable gift for that special someone, these stylish earrings never fail to make an impact.